How much ever old we are, I guess a part of us always stays young. And I believe its true to a very large extent in my case. There was a Barbie movie playing in the television yesterday, and I got so lost in it that I even forgot to prepare dinner. Fantasy, Magic, True love and First kiss – something which every girl in teens dreams of. And some like me still dream about. These movies are unusual, the love stories are offbeat, and the storylines are far from reality. But still there is some magic in them. My teens were also nourished by similar type of romantic Novels. Especially those by Mills and Boons. The hero in these books is tall, dark, handsome, very rich and well mannered. Falls in love with heroine- love at first sight. And there is always happy ending – they lived happily ever after! I will get in to the reality later. 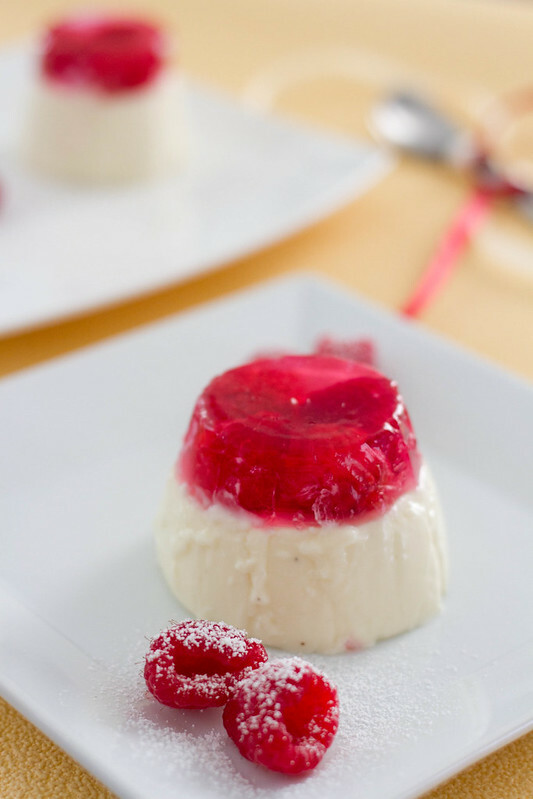 Lets stay in this other world for sometime and enjoy this fabulous dessert perfect for romantic evenings. Put Raspberries, sugar and water in a bowl and place it on a pan with simmering water. Gently mix the mixture without disturbing/damaging the raspberries. You should get a nice pink color infusion. Squeeze the gelatin and dissolve in the raspberry mixture. Spoon 4 raspberries into each mould, and spoon two teaspoons of liquid over the raspberries. Soak gelatin leaves in cold water. Heat cream on medium heat and add sugar. Stir to warm up and sugar to dissolve for 5 mins, do not boil. 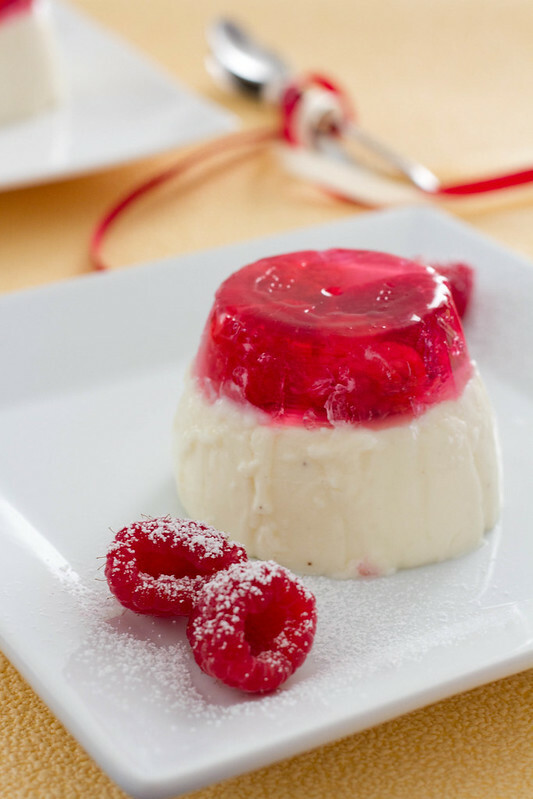 Remove from heat, squeeze the gelatin and stir into cream, mix well. Add yogurt and whisk in, do not over whisk. Add a teaspoon of vanilla extract. Now remove the moulds from the fridge and pour the cream mixture on them. Set in fridge for about 4 hrs or over night. Unmold and serve with fresh fruit.To unmold place the moulds in hot water just for a min and tap gently. Do not worry if you dont have vanilla yougurt. Instead use normal yougurt and add 50 gms extra sugar(increase or decrease according to your taste. 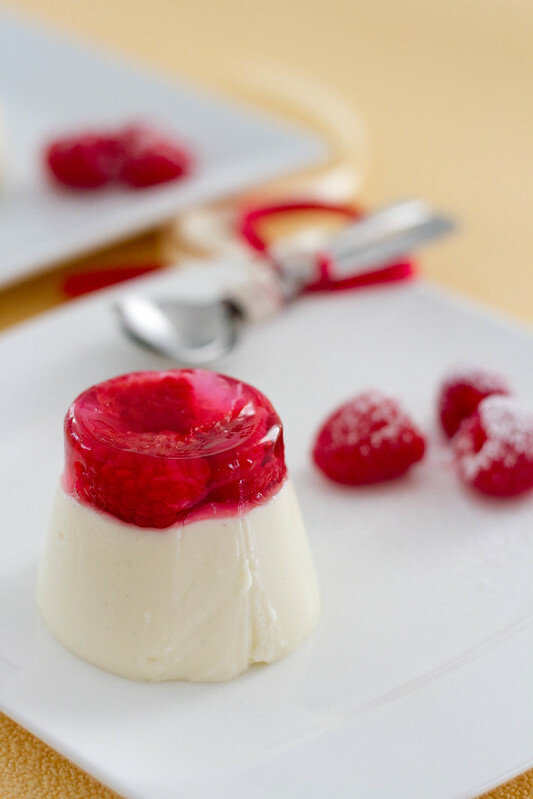 If you do not want to unmould, set the dessert in some pretty glasses with the raspberry layer on the pannacota. 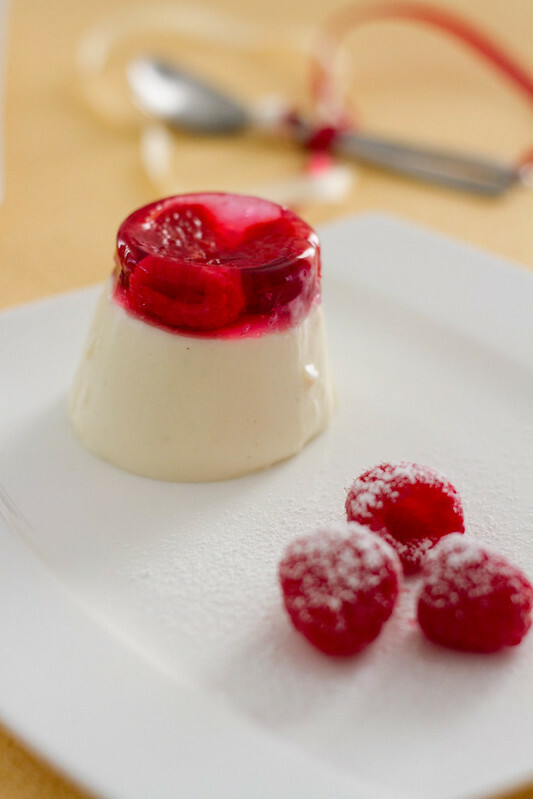 When Raspberries are not available try this with any other berries. It will taste absolutely delicious. your recipe is amazing no doubt but your writing skills … laajawab! Oh! you are so flattering .. love u! Hey lovely post and beautiful clicks…worth giving a try! And what a treat to share love. Seriously pretty and the red, the glaze of raspberry jello .. brilliant! Love love dessert like this, i agree aobut age, my hubbies grandmother is 100 yrs now and she still say she feel 18 i guess it is also haw we feel mentally. Stunning photographs Spandana – hope my room mate is well? I am doing great Jo. How are you. Howz the photography going on?